Hailed as "one of the greatest minds of our times," R. Buckminster Fuller was renowned for his comprehensive perspective on the world's problems. For more than five decades, he developed pioneering solutions that reflected his commitment to the potential of innovative design to create technology that does "more with less" and thereby improves human lives. Born in Milton, Massachusetts, on July 12, 1895, Richard Buckminster Fuller belonged to a family noted for producing strong individualists inclined toward activism and public service. "Bucky," as he came to be called, developed an early understanding of nature during family excursions to Bear Island, Maine, where he also became familiar with the principles of boat maintenance and construction. Fuller entered Harvard University in 1913, but he was expelled after excessively socializing and missing his midterm exams. Following his expulsion, he worked at a mill in Canada, where he took a strong interest in machinery and learned to modify and improve the manufacturing equipment. Fuller returned to Harvard in the autumn of 1915 but was again dismissed. From 1917 until 1919, Fuller served in the U.S. Navy, where he demonstrated his aptitude for engineering by inventing a winch for rescue boats that could remove downed airplanes from the water in time to save the lives of pilots. As a result of the invention, Fuller was nominated to receive officer training at the U.S. Naval Academy, where he further developed his ability to study problems comprehensively. In 1926, when Fuller's father-in-law, James Monroe Hewlett, developed a new method of producing reinforced concrete buildings, he and Fuller patented the invention, earning Fuller the first of his 25 patents. In 1927, after the construction company failed, Fuller was unemployed and contemplated suicide, but he had a remarkable realization. Deciding that he had no right to end his own life, he concluded that he had a responsibility to use his experiences and intellect in the service of others. As a consequence, he spent nearly two years as a recluse, deep in contemplation about the universe and how he could best contribute to humanity. One of Fuller's lifelong interests was using technology to revolutionize construction and improve human housing. 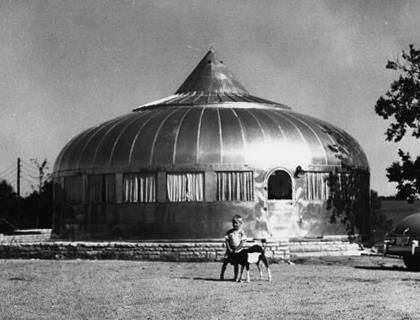 In 1927, after inventing an easily built, air-delivered, modular apartment building, he designed the Dymaxion™ House, an inexpensive, mass-produced home that could be airlifted to its location. Originally called the 4D House, it was later renamed by a department store that displayed a model of the house. The word "dymaxion" was coined by store advertisers and trademarked in Fuller's name. Based on the words "dynamic," "maximum," and "ion," it became a part of the name of many of Fuller's subsequent inventions. The word became synonymous with his design philosophy of "doing more with less," a phrase he later coined to reflect his growing recognition of the accelerating global trend toward the development of more efficient technology. These inventions included the Dymaxion Car, a streamlined, three-wheeled automobile that could make extraordinarily sharp turns; a compact, prefabricated, easily installed Dymaxion Bathroom; and Dymaxion Deployment Units (DDUs), mass-produced houses based on circular grain bins. While DDUs never became popular for civilian housing, they were used during World War II to shelter radar crews in remote locations with severe climates, and they led to additional round housing designs by Fuller. After 1947, one invention dominated Fuller's life and career: the geodesic dome. Lightweight, cost-effective, and easy to assemble, geodesic domes enclose more space without intrusive supporting columns than any other structure; they efficiently distribute stress; and they can withstand extremely harsh conditions. Based on Fuller's "synergetic geometry," his lifelong exploration of nature's principles of design, the geodesic dome was the result of his revolutionary discoveries about balancing compression and tension forces in building. Fuller applied for a patent for the geodesic dome in 1951 and received it in 1954. In 1953 he designed his first commercial dome for the Ford Motor Company headquarters in Dearborn, Michigan. The U.S. military became one of his biggest clients, using lightweight domes to cover radar stations at installations around the Arctic Circle. According to the Buckminster Fuller Institute, today there are more than 300,000 geodesic domes around the world, ranging from shelters in California and Africa to radar stations in remote locations, as well as geodesic structures on countless chidren's playgrounds. Fuller was a pioneering global thinker. In 1927, at the beginning of his career, he made a now-prophetic sketch of the total earth which depicted his concept for transporting cargo by air "over the pole" to Europe. He entitled the sketch "a one-town world." In 1946, Fuller received a patent for another breakthrough invention: the Dymaxion Map, which depicted the entire planet on a single flat map without visible distortion of the relative shapes and sizes of the continents. The map, which can be reconfigured to put different regions at the center, was intended to help humanity better address the world's problems by prompting people to think comprehensively about the planet. In the early 1950's he coined the now familiar phrase "spaceship earth" to describe the integral nature of Earth's "living system." Beginning In the late 1960s, Fuller was especially involved in creating World Game®, a large-scale simulation and series of workshops he designed that used a large-scale Dymaxion Map to help humanity better understand, benefit from, and more efficiently utilize the world's resources. Throughout his life, Fuller found numerous outlets for his innovative ideas. During the early 1930s he published Shelter magazine, and from 1938 until 1940 he was science and technology consultant for Fortune magazine. During the 1940s he began to teach and lecture at universities, including Harvard and MIT, and in the late 1950s he became a professor at Southern Illinois University (SIU), where he and his wife lived in a geodesic dome when he was in residence. In 1972 he was named World Fellow in Residence to a consortium of universities in Philadelphia, including the University of Pennsylvania. He retained his connection with both SIU and the University of Pennsylvania until his death. He was the author of nearly 30 books, and he spent much of his life traveling the world lecturing and discussing his ideas with thousands of audiences.. Some of Fuller's many honors highlight his eclectic reputation: For example, because he sometimes expressed complex ideas in verse to make them more understandable, in 1961 he received a one-year appointment to the prestigious Charles Eliot Norton Professorship of Poetry at Harvard. After being spurned early in his career by the architecture and construction establishments, Fuller was later recognized with many major architectural, scientific, industrial, and design awards, both in the United States and abroad, and he received 47 honorary doctorate degrees. In 1983, shortly before his death, he received the Presidential Medal of Freedom, USA's highest civilian honor, with a citation acknowledging that his "contributions as a geometrician, educator, and architect-designer are benchmarks of accomplishment in their fields." After Fullers death, when chemists discovered that the atoms of a recently discovered carbon molecule were arrayed in a structure similar to a geodesic dome, they named the molecule "buckminsterfullerene." R. Buckminster Fuller died in Los Angeles on July 1, 1983. Bucky wrote more than 30 books over the course of his career (see https://www.bfi.org/about-fuller/resources). Several of these books, including Synergetics I and II are available online at bfi.org and other sites.